World Trade Center Dublin The World Trade Center Dublin (WTCD) provides business and trade organisations across Ireland with a gateway to new international trade opportunities, collaboration, and education. It also serves as a resource for companies around the world seeking trade opportunities in Ireland. World-class connections: World Trade Center Dublin is committed to forging strong partnerships both at home and abroad in partnership with the Drew Company of Boston; a strategic partnership which enables the WTCD to develop and deliver a range of initiatives, trade programmes, expert understanding and trade collaborations that cross international boundaries. By leveraging the vast resources and competencies of its world-class facilities, WTCD bridges the international divides, where Ireland and the global trade community come together. About World Trade Centers: More than a building or an organisation, a World Trade Center (WTC) is a thriving microcosm of the businesses, services, organisations and individuals, involved in the world of trade. A global commerce site which offers prime interactivity and exposure to the businesses driving international trade. Information, expertise and energy – elements essential to successful trade on a global scale – power the WTC environment, enabling immediate access to the valuable expertise that drives export of all kinds. World Trade Centers Association (WTCA) History: The WTCA is a not-for-profit, non-political association that exists to foster the development and success of international business trade. Its membership includes nearly 300 WTCs in almost 100 countries. Over 750,000 companies are affiliated with WTCA members worldwide. The WTCA was established in 1970 to facilitate international trade and to offer exporters, importers and service providers a resource and commerce base. The first of these pioneer Centers were built in Houston, New Orleans, New York and Tokyo, after which the World Trade Centers Association was borne. WTCs stimulate local, national and global economies within the framework of a virtual marketplace; a centre-point of access and exposure critical for international trade success. “A World Trade Center in any city is a business shopping centre, complementing and supporting the existing services of private and government agencies,” explains World Trade Centers Association (WTCA) Founder, Guy F. Tozzoli. Experienced Management: The Drew Company The World Trade Center Dublin is the product of the experienced leadership of global trade professionals and innovators from around the world. John Drew is founder and Chairman of the Drew Company, a Boston-based real estate management and development company. He serves as Chairman of Trade Center Management Associates, which manages the Ronald Reagan Building and International Trade Center in Washington, D.C., and the World Trade Center Dublin. Mr. Drew has been a member of the World Trade Centers Association since 1985 and currently serves as Chairman of the Board of Directors. He is also the developer and past Chairman of the Seaport Companies: Seaport Hotel and World Trade Center Boston, Seaport East and Seaport West. 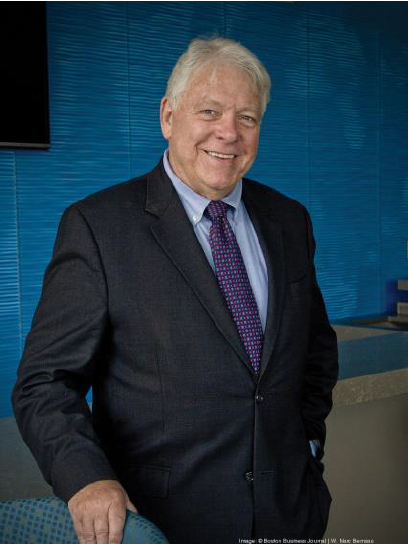 As developer and partner of the World Trade Center Boston and Seaport Hotel, John Drew is a pioneer in the development of Boston’s revitalized Seaport District. Since its opening in 1986, the World Trade Center Boston has become one of the premier facilities for conferences and exhibitions in New England. Mr. Drew led the development of a three-building, 1.75 million s.f. expansion of the World Trade Center complex that included a hotel, offices, retail areas and parking facilities. The 426-room Seaport Hotel opened in 1998, World Trade Center East opened in 2000, and World Trade Center West opened in 2002. Mr. Drew’s second major trade center project is the Ronald Reagan Building and International Trade Center in Washington, D.C., which opened in 1998. The International Trade Center, located at the Ronald Reagan Building, is the US government’s most prominent site for trade promotion and the second largest federal building in the United States next to the Pentagon. In addition, the ITC’s conference center has become the premier forum in Washington D.C. for international meetings and major special events, hosting over 1,500 trade events annually. In 2010, Mr. Drew began the business operation of the World Trade Center Dublin with an objective to raise the profile of Ireland internationally and promote it as a country of innovation, opportunity and talent. In addition to assisting companies improve their global competitiveness, the World Trade Center Dublin assists members to achieve its international trading objectives through trade, educational and networking programs and events. In 2002, Mr. Drew was appointed by the Principality of Monaco to serve as Honorary Consul of the Consulate of Monaco, overseeing the New England states and served as Consul until 2013. He also advises the US Department of Commerce in his role as Chairman of the United States Northeast District Export Council, Massachusetts region. The Drew Company’s development portfolio includes the Tweeter Center for the Performing Arts (Now Xfinity Center), Bayside Exposition Center and Constitution Plaza in Boston. The firm also provides asset management services, as well as development advisory services to businesses in the U.S. and abroad. Waterside Place, a 236-unit mixed-use luxury rental apartment building opened in January 2014 in the Seaport District. The firms’ latest project is Gables Seaport, a 307-unit luxury rental apartment building, scheduled to open in early 2020. The Drew Company is also the selected developer for a new convention center hotel for the Georgia World Congress and Convention Center project in Atlanta. Prior to founding his firm, Mr. Drew served as Director of Federal Relations for the City of Boston. During that time, he was responsible for the creation of the “Boston Plan,” a redevelopment plan for the city. In recognition of this achievement, the Boston Jaycees named him one of its “Ten Outstanding Young Leaders.” Mr. Drew serves on the Board of Directors of the Greater Boston Chamber of Commerce, Stonehill College, Cathedral High School in Boston, and former Chairman and current Executive Committee Member of the Board for the Boston Municipal Research Bureau. He also served as Chairman of the Boston 2000 Commission, having been appointed by the Mayor of Boston. Mr. Drew received his undergraduate degree from Stonehill College, a master’s degree from Boston University, a Honorary Doctorate of Humane Letters from Newbury College, and is one of the region’s top authorities on public-private partnerships and development. His civic commitments include Chairman Emeritus for Caritas Christi Health Care System in Boston, and Chairman of “A Better City” (an organization of business leaders working to ensure Boston’s future competitive advantage). Mr. Drew’s impact on tourism, hospitality and development in the Boston area has won him numerous awards and distinctions. He has received an honorary degree from Newbury College and a lifetime achievement award from the Boston Jaycees. He was presented with the “Distinguished Individual” award from the Massachusetts Hospitality Association, was honored as one of the “Top 125 Leaders Making a Difference in Boston,” from Banker and Tradesman, was honored by NAIOP (National Association of Industrial and Office Properties) in 2002 as “Developer of the Year,” the Boston Business Journals’ Power 50 Award in 2012, and the 2012 Outstanding Building of the Year (TOBY) Award from Building Owners Managers Association. In 2013 he was recognized by Irish America Magazine as one of the Business 100 Irish-American leaders in the U.S. In May 2014, he received the Justice and Compassion award from Catholic Charities for his philanthropic contributions and support of social service organizations, nonprofit, and educational foundations throughout the community. He was honored with the Visionary Award from the Boston Business Journal in May 2015 and most recently in 2016 awarded the Robert S. Swain Jr. Distinguished Service Award by the Real Estate Finance Association (REFA).